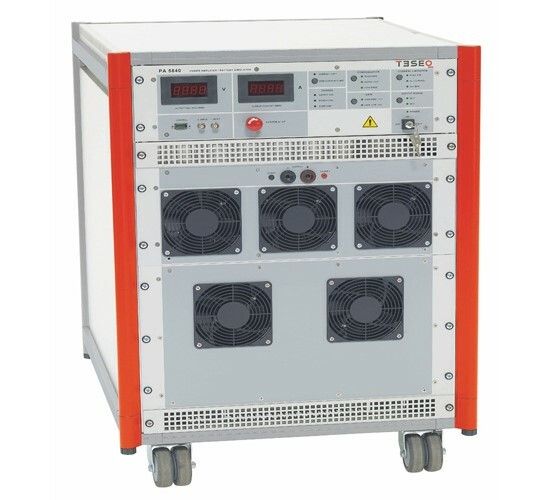 This battery simulator is designed to replace the vehicle battery in the test environment. These sources must fulfil various criteria concerning power rating, voltage, slew rate, impedance, etc. depending on the particular application. Bi-polar current sources are specified for in several cases. With bandwidths three times the other amplifiers and inrush currents far exceeding other comparable solutions, pulse 2b, pulse 4, sine wave noise and other complex simulations are realm of the PA 5840 series. Of course the amplifier is also perfectly suited for ISO 7637 compliant simulated conducted transient testing. Offering combinations of features that exist in no other battery simulator, the PA 5840 series is the right product for your EMC needs. Designed specifically for automotive EMC testing, Teseq’s 42V ready amplifier sets the pace for automotive battery simulation including features necessary for automotive immunity testing such as sense wires for cable voltage drop compensation and several operating modes for stability with complex automotive loads. Consistent with the philosophy of the Teseq’s EMC concept, the PA 5840 utilizes a modular structure so that upgrades can be implemented in the future. The control unit, power stage and power supply are all separate rack-mounted functional units for easy exchanges and upgrading.